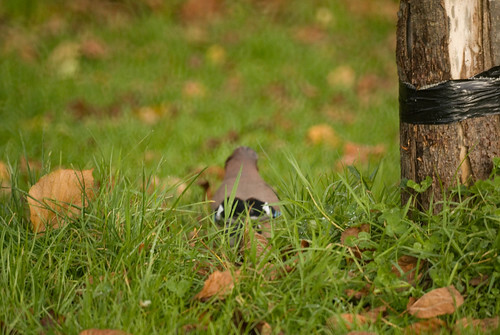 This was taken a while back in autumn. 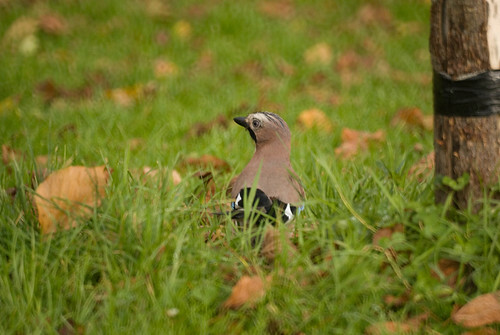 While walking with my wife, we spotted this Jay sitting on the grass. It appeared to have something in its mouth. When it raised its head, we noticed it was an acorn (seed of the Oak tree). 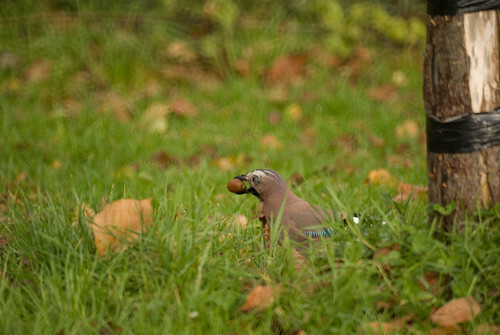 Acorns form an important part of the Jays diet.The Jay is an important dispersal agent for the Acorn seed. Since the seeds are too heavy to be dispersed by wind, they require help from animals and birds for dispersal. 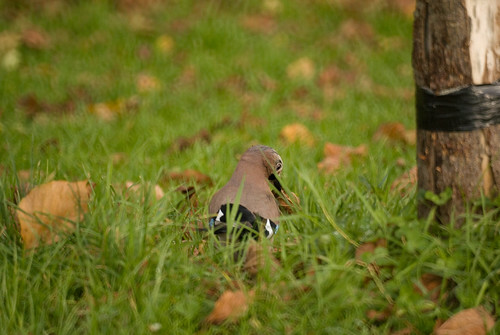 However, the Jays are very selective about which acorns they choose. Acorn`s contain tanins, which are very bitter and are polyphenols which interferes with the bird’s protein metabolism. 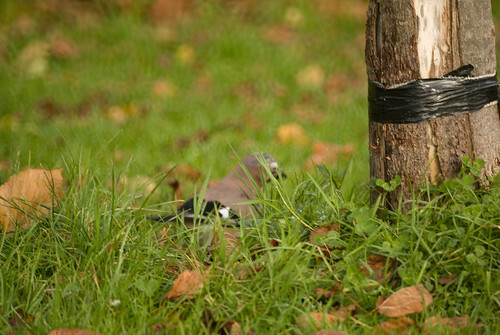 Thus Jays select acorns which contain lower levels of tanins. 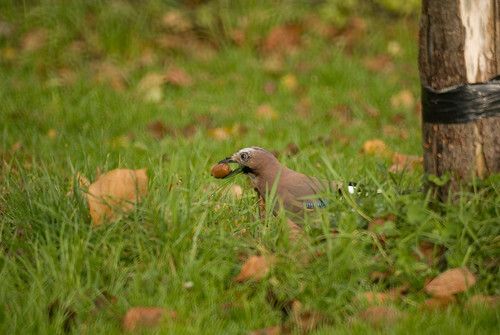 The Jay picks the acorns by size and carries it in its throat for transport. They are known to preferentially select larger sized acorns, possibly for its higher nutritional content. However, if the size is too big, it has to carry the seed in its beak. 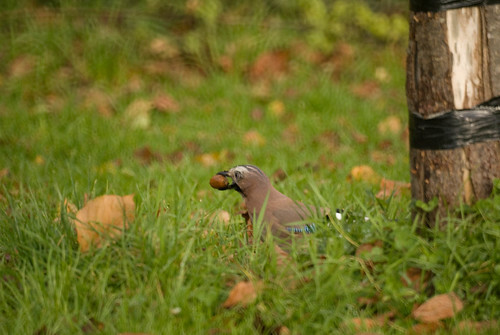 once, it has collected the acorns, the Jay stashes it away in a cache that is well remembered. The caching process allows ground water to percolate through, thus leaching some of the tanins away. 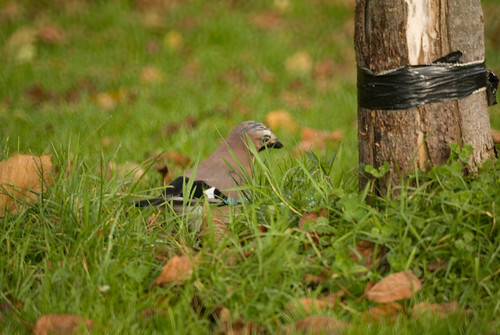 I believe the jay here is involved, not in collection but in the caching process. 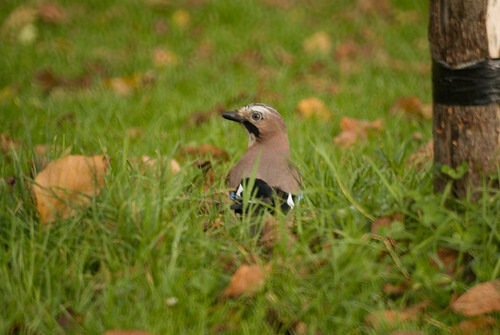 for when it raised its head after seeming to grovel in the grass, it had no acorn in its mouth. 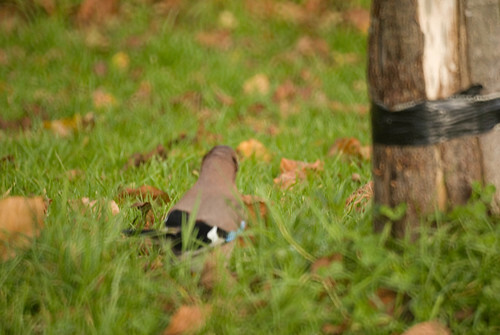 It then proceeded to take a few dry leaves in its mouth and cover up its stash. 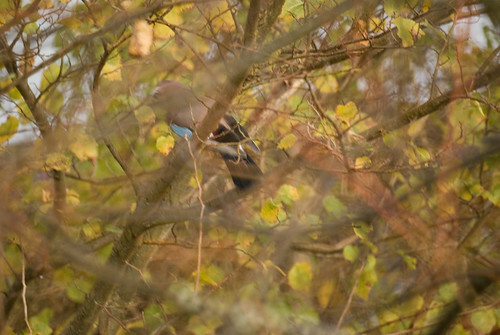 …..and took to the trees. 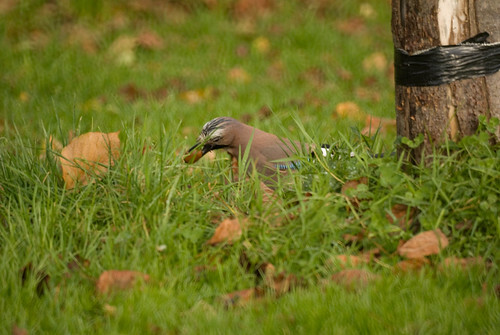 The cache would have had enough water percolation by now in winter and will hopefully serve as a dependable source of food for the Jay, when other sources are hard to come by….if a squirrel hasn’t found that stash first that is!